A signal cable's quality is primarily determined by the relationship of its conductors and dielectrics. In the late 1800's, signal cables were created to replace telephone, open wire, transmission lines. In the 1800's, telegraph signals used a single open wire lead and the ground for the return. Transmission distance and dynamic range were determined by voltage and repeater sensitivity. It was a simple rising impedance system that could deliver a finger tapped, digital signal 200 miles on an 8 gauge wire! By 1870, the “open wire, ground return” systems hit their limit. With the advent of the Telephone millions of quiet, low distortion lines would be needed. The existing cables were unusable because of a basic miss match in the way conductors and dielectrics transfered signal. By 1873, James Maxwell had deduced four basic laws that explained known electric and magnetic phenomenon, but it was two more decades before they found a workable solution cable problem. By 1890, shielded, dry paper insulated cables evolved. The better dielectric constant and the velocity of propagation of dry paper improved sound quality and transmission distance, but after this, the quality of telephone cables has changed very little. 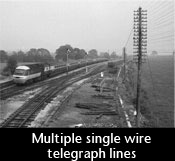 Compared to "open wire", cables were still inefficient, signal quality was poor and transmission distance was very limited. 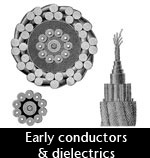 The cable problems were and always will be, rooted in the difference between conductor and dielectric time constants. Signal travels at light speed on open wire, but must slow considerably in cables, as conductors are forced to track the slower dielectric velocity of propagation (VoP). At audio frequencies the trauma of this transition obliterated the signal in short order, rendering cables unusable except for short distances. As a note, dry paper insulated, twist pair cables of the time were probably superior to what we have today. Technically dry paper is a better dielectric than PFA. As used by the telephone company, the cables were pressurized with dry nitrogen to assure the paper maintained its dielectric constant of 2.0 or less. By 1900 the country was in crisis and ATT (Bell) offered a huge reward to any one that could resolve the problem. 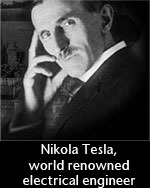 In 1904, Michael Pupin came forward with the solution. By placing coils of wire in series with the conductor, at intervals in the cable, you could match the conductor propagation velocity (and subsequent cable loading) to that of the dielectric. They were called load coils (or Pupin coils or inductors). They did not really fix the cable problem, but combined with a plethora of networks, EQ and amplification, they did make cable usable. In effect they traded bandwidth and dynamic range for a fairly dramatic increase in the distance over which an intelligible signal could be transmitted. A patent was issued to Michael Pupin in 1904 and AT&T paid him generously for its use. The basic flaw in load coils is that they make the correction at intervals rather than continuously in the cable. Essentially they match conductor velocity to that of the dielectric with a series of chokes. 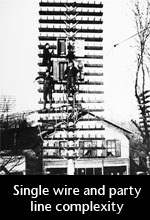 Cable itself has changed little since the 1890's. The focus is on compensating for its problems or bypassing it all together. A true solution to telephone audio frequency cable problems was not found. Radio and Digital Carrier Systems simply bypassed the audio cable problem by converting the signal to easily repeated pulses. 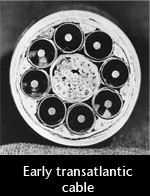 These systems made the first transatlantic telephone cable possible. 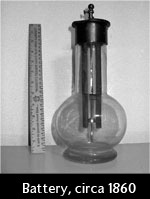 In 1956, using a pair of huge, unidirectional coaxial cables with polymer dielectric in ridged copper tubes, they could carry 48 lines, with a bandwidth of 3 kilohertz, over 1500 miles between Scotland and Nova Scotia, using nearly 100 repeaters. Local telephone service still uses coil loaded balanced lines (3.2 kilohertz Bandwidth). With equalization and amplification, a directional pair of these cables can cover small distances. For longer runs load coils are removed and digital carrier is used. In the 1960s, audio began to establish its own standards. The lossy “600 ohm balanced lines” were abandoned before stereo arrived and solid state components in the 1970's drove originating impedances even lower, making the “rising impedance system” universal. This "system” is very efficient, but provides little or no cable damping and cable resonance was back! Signal quality was lost and at first, "solid state" took the blame. But in reality solid state was only one part of a complex chain reaction. A cable resonance control system had been unceremoniously dropped in the pursuit of simplicity, component compatibility, larger dynamic ranges and the economy of construction. The origin of bright fatiguing sound, was a ghost from days gone by, because we forgot the cable! In the 1970's, the realization that cable was indeed part of the equation spawned a era of experimentation. Soon cable alternatives became available, along with the screams of nay sayers. It is amazing how fast we lose the lessons that were learned by our ancestors. In the 1980’s, signal cable reasearch resumed with a vengeance in audio industry. It was soon apparent that loss was not the issue, and it was also apparent that conductors made a noticeable change in cable resonance and glare. Tiny bronze strands, individually insulated, in different lays (litz wire), concentric's, weaves and braids, different shaped large solid conductors, and different metals were tried. Eventually dielectric involvement was minimized and a conductor geometry evolved! In the 1990's, resonance associated with metals and dielectrics, microphonics, eddy currents and many other issues that contribute, in part, to a complex picture were and continue to be addressed. To achieve a dynamic range of true resolution, over a 100db range, requires attention to many details in the cable and connections. In the end the main problem will be the same: dielectrics can't transfer charge as fast as conductors can propagate and “rising impedance systems” can't shunt the resultant electrical turbulence. By 2000 most of the cards were on the table, face up, if you chose to look. The main players were busy making cable and gave little time to those who wished the cable problems were not true. The overall depth of knowledge is now at a new level. I for one am enjoying watching it sink in. 2009 The impact of conductor/dielectric transition time differentials runs deep. Asymmetrical dielectric charge and decay causes subtle waveform distortions, floating DC offsets, inter transient noise, and veiling of low level information. It is responsible for Inter Symbol Interference (ISI) and jitter. It is why the dielectric constant seems to vary with frequency. It is the most fundamental issue that must be resolved in cable design. The speed (Vop) of Solid and bare stranded conductors is about 127% of the best solid dielectric. How you balance this difference is key to cable quality. Simply reducing dielectric involvement or placing coils on the ends of the cable is not the answer. By Matching conductor velocity to dielectric constant, resonance and waveform distortion can be eliminated, without the bandwidth and dynamic range limitations of periodically loaded cables or the glare and distortion of unloaded cables. Signal in a cable can be envisioned as a boat entering a canal at high speed. Initially, the boat breaks the surface of the water with much turbulence. As the boat begins to decelerate it generates a smooth wave (charge builds in the dielectric) and as the boat speed approaches wave speed (VOP) turbulence subsides. The boat can now travel at wave speed without creating any turbulence. This speed is the VOP of the boat in water. Matching conductor propagation to dielectric constant, rather that allowing the change to take place as cable length accrues, quiets transient turbulence and makes it possible to produce a silent cable that sounds the same at every length and maintains the clean, natural harmonic halo found in the original signal. It is curious how the human focus works. Seemingly gross flaws in low frequency reproduction and crossovers are largely ignored as we try to view tiny details through windows of clarity in the system. Details at -60 db from the fundamental signal are still relevant and those details are strongly influenced by the quality of the cables.